IronCAD, LLC, the leading provider of design productivity solutions, officially announced the immediate availability of IronCAD Design Collaboration Suite 2016 Product Update 1. With many new features developed by working closely with customers and resellers, the suite of products continues to offer real productivity gains to customers across fabrication and assembly design. 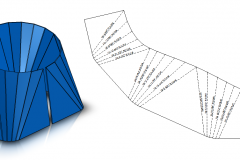 With a focus on productivity enhancements, sheet metal design, detailing and others the 2016 Product Update 1 boosts significant improvements in designing and modeling flexibility. TriBall Center-Point Snap to Nearest — Often when you are designing, you will use the TriBall to position objects with respect to other geometry. 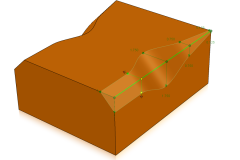 One of the common tasks is to move the object to a midpoint of an edge or a vertex. The TriBall provides the ability to drag the center-point and snap to these locations. To speed up this common task, you can now drag the center-point of the TriBall and hold the shift-key to enable “Snap to Nearest.” Simply drag onto an edge and the TriBall will snap to the nearest point or midpoint on the highlighted edge. Release the mouse and it is precisely placed without having to move the extra amount to locate the points. Variable Edge Chamfer — The edge chamfer command has been enhanced to support different inputs along the selected edge. 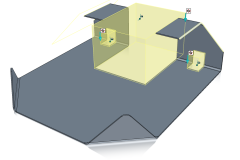 You can select a 2 Point (Distance), 4 Point (Distance-Distance Settings), 2 Point (Distance Angle) and a powerful variable distance with any number of points along the edge. This capability opens up the flexibility to modify geometry to more complex conditions without using typical cutting operations. IronCAD Native Translator Support for BOM Property Import — The native translator which supports native formats such as Inventor, Solidworks, Pro/E(CREO), UG/NX, SolidEdge, has been enhanced to support BOM property information stored with these files. For example: Part Number, Description, Material Name, Material Density, and other custom properties can be transferred during the import process into IronCAD applications. This enhances the reuse of data from other applications without the need to re-input the data for reusable parts or standard parts. 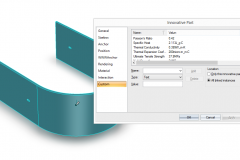 Improve Feature Support and Enhanced Unfold for Sheet Metal — IronCAD’s sheet metal has been improved to support many additional operations that are standard in IronCAD’s part modeling. 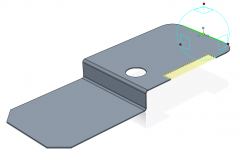 For example, users can now apply standard cut features that can affect multiple bends in sheet metal, blends and chamfers on stock corners, and operations such as Trim where you can cut the sheet metal by other objects. In addition, this enhanced behavior improves the unfold operation time to speed up the design process. Sheet Metal Loft Support for Square to Ellipse Transitions — In 2016, the sheet metal loft was enhanced to support formed and pressed bent operations. This version has been enhanced further to support the transition from Square to an Ellipse for press bent sheet metal. This is a valuable improvement for these types of transitions especially for square to circular designs that may have angled planes for the loft when unfolding to generate a press bend layout. In addition to these productivity improvements, Product Update 1 also includes more than 100 quality improvements in stability and performance. IronCAD Product Update 1 is available for immediate download for customers on active Armor Advantage and Software Subscription contracts using the IronCAD customer community. For the full list of enhancements click here: http://www.ironcad.com/product-update/ironcad-design-collaboration-suite-2016-service-pack-1.